Last week a friend and I were talking about balanced eating. She asked about what motivated me to cook everyday I was home, and if I truly ate everything I baked (like those seven spoon’s chocolate chip cookies I made last weekend). The truth? I’ve always believed that balance is important, not only in our daily lives but also when it comes to eating. Life is way to short not to have that cookie. So if you enjoy having an ice cream sandwich on a hot summer’s day (which I can’t wait for!) or a piece of birthday cake, you should. 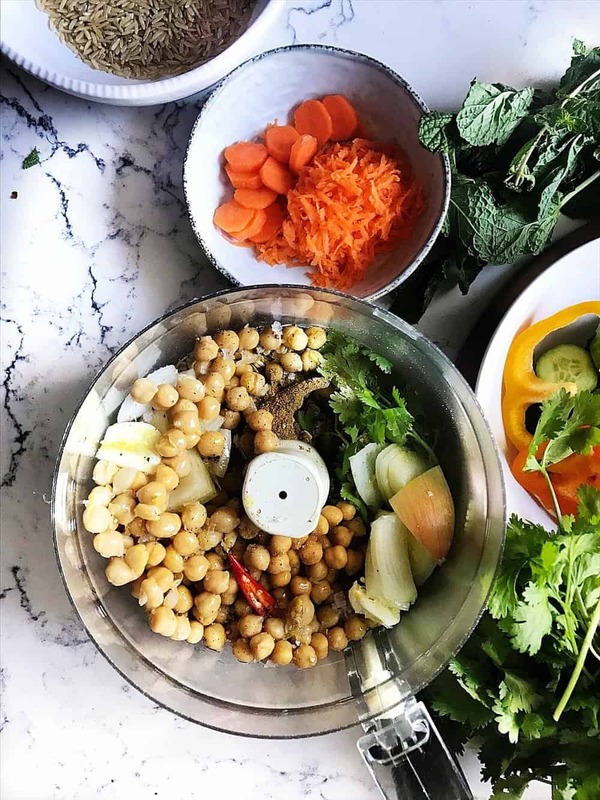 As long as most of the time you make it a priority to eat well by cooking meals at home that are wholesome and include the vegetables you like. What about working out? I’ve been doing crossfit for 5 years but anything you choose, whether it be running, yoga or gym time, will help keep not only a healthy body, but most importantly a healthy mind. 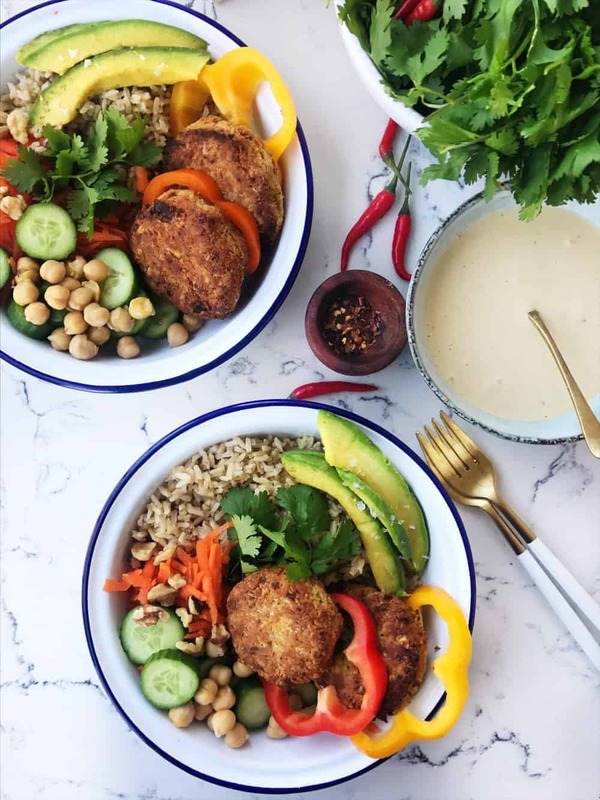 If you’ve been reading the blog for a while, you know that I like meals I can make in under 40 minutes like these Falafel bowls. 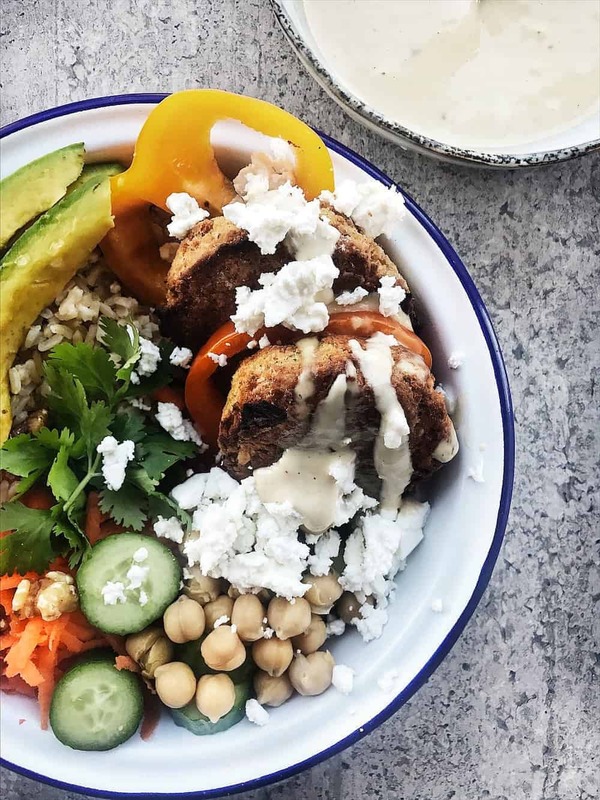 Served with brown rice, and drizzled with tahini, this is what you want to have for lunch or dinner to start the week right. Cook brown rice as per instructions. Whirl on pulse until mixture comes together and you can see small to sized pieces of chickpeas. You want the mixture to hold together, and a more paste-like consistency will help with that, but don’t overprocess, you don’t want it turning int . 6 to 8 pulses will do. Transfer to a bowl and chill in the fridge for 10 minutes. Shred the carrots, cut the peppers, cucumbers and slice a few pieces of avocado. 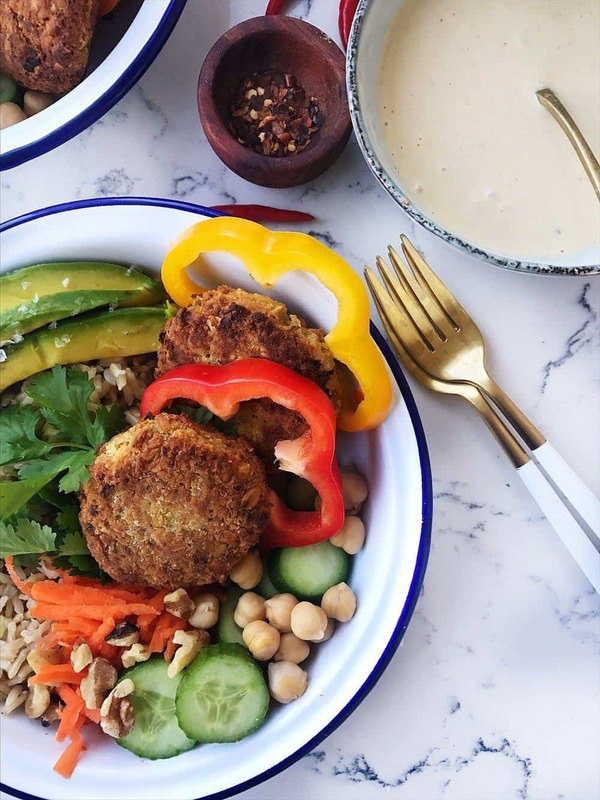 Preheat your over to 375 F.
Take the bowl out from the fridge and start shaping the falafels. You can use 3 tbsp for each and make sure to flour your hands before this step. In a frying pan, heat 2 tbsp coconut oil. Then add 3 falafels at a time turning once and cooking for 2 minutes per side. This step will guarantee a crispier texture outside. Transfer to a baking sheet lined with parchment paper and bake for 12-15 minutes. 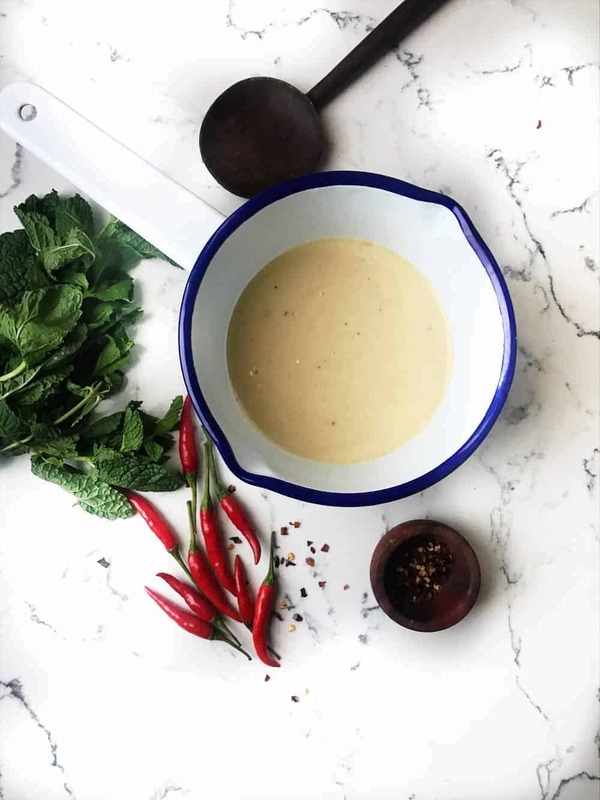 To make the tahini sauce whisk all the ingredients in a medium bowl and set aside. 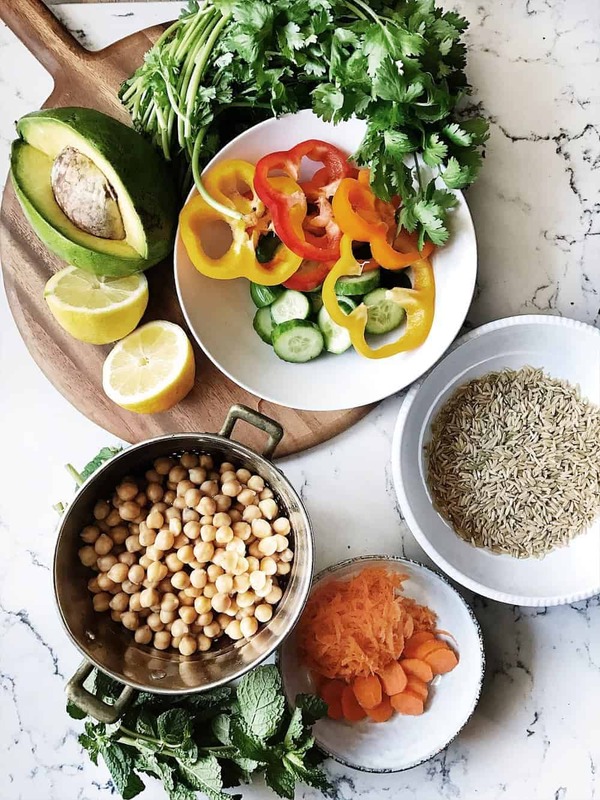 Build your bowls by adding rice, peppers, cucumbers, chickpeas, carrots, avocado, cilantro, feta, walnuts and cilantro or parsley). 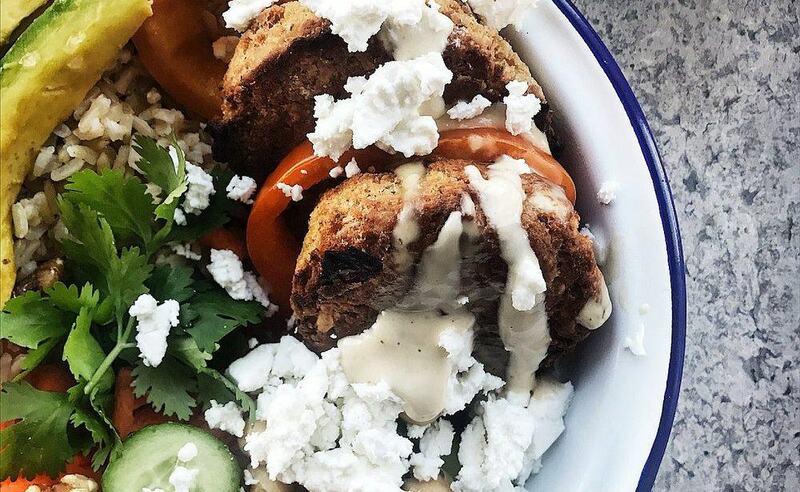 Top with 2 or 3 falafel and drizzle with tahini sauce. Straight to Damo’s "must try" recipes, thanks! Can’t wait til you make them Damo!! 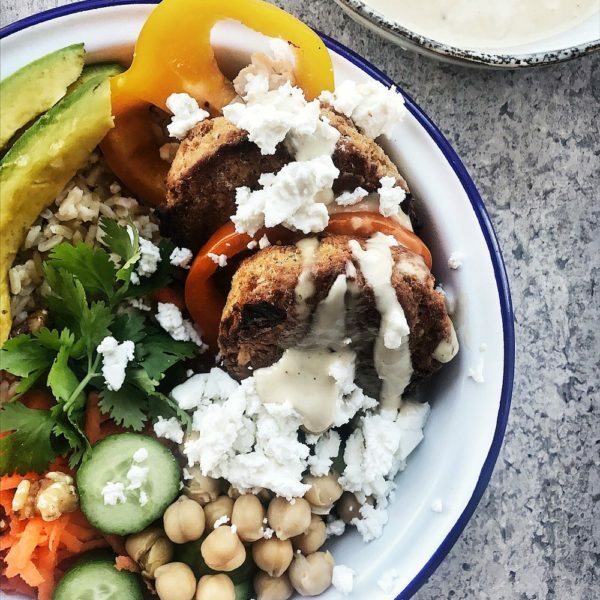 That tahini sauce is gold!